There is no garanty on the second hand equipement. The price is without transport cost. If not satisfied, the devices can be returned within 3 weeks. This liquid nitrogen tank is like new and has been used only once. 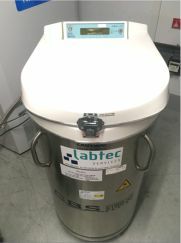 The tank was qualified each year by a Labtec service technician. For storage of the biol. Materials with a storage capacity in drawers with divider inserts for 4 000 x 2 ml vials diam. 12 mm sterile. Netzmikrometer, Hilfsmikroskop, Pol-Filter, Analysator für Schaltachse, Kamera-Ansatz, Polaroid Packfilmkassette, Belichtungssteuerung. The plant is made up of 'büchiflex' standard glass components including all fittings and sealings. Spares can be ordered at the manufacturer and the plant can be easily extended. Price new: 26 000 Euro. Knaur UV 2500 Detector, RI 2300 Detector, Alltech ELSD 3300 Detector, twoo pumps 1000, Pumpmanager 5000, twoo Autosampler 3950, Alltech ELSD nitrogen generator, PAKO compressor 228/100W. The plant was serviced annually by the company Flowspek in Basel. Manuals / Operating Instructions and Software EZCrome Elite. Must be dismantled and removed by the purchaser. The temperature is freely adjustable in steps of 0.1 ° C. The heating elements are integrated in the walls to ensure good temperature stability and homogeneity. Supplied with a slot that can be racked in 2 different positions.